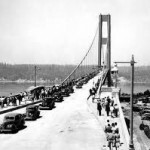 On July 1, 1940, the Tacoma Narrows Bridge opened to traffic for the first time. It was trim and elegant, the state of the art in suspension bridges. Only a few short months later, on November 7 of that same year, this same bridge succumbed to gale force winds and twisted itself into the makings of a man made reef at the bottom Puget Sound. Obviously there were some unrecognized flaws in the graceful design. Many of us see other flaws in other designs all the time. Unfortunately, so many of them are not recognized by the designers until they are revealed by some unexpected tragedy. One design flaw currently working its way through our economy is the Federal Reserves monetary policy. Our country was founded on the principles of thrift, economy and independence. Our central bank, along with other associated financial institutions, has been laying the groundwork for years to draw our country into a web of debt and dependence our forefathers would have rejected at first bloom. Ostensibly, to keep inflation under control they have kept their borrow window rate at sub one percent levels. This is designed to facilitate and encourage borrowing. However this has notalways been the result. Many banks, instead of lending for expanding businesses and employment, are using these funds to purchase government securities. They are, up to this point, safe and guaranteed. They don’t have the risk of personal and commercial loans. This is not completely bad, but it short circuits the entire banking arrangement. These unrealistically low interest rates have all but destroyed the incentive to save. For those readers with doubts and who can endure an insult from a well dressed banker, just check out the interest rate on savings accounts at your local bank. It’s likely to be in the neighborhood of half a percent. CDs are not that much better. But, Ben Bernanke’s strategy to keep “core inflation” under control appears to be working as planned. But it is not. Anyone living in the real world understands that the “core inflation” numbers they want us to accept have little relation to reality. Prices are rising, interest is almost non-existent, we are tempted to borrow at, sometimes unattainable rates and businesses that create jobs cannot get the funds they need to expand. The exception to this is consumer credit which we shall look at shortly. There is a design flaw in the system. It has created borrowers struggling pay their loans back. It has removed the incentive to save. People have been pushed into other investments where they are whipsawed by unstable prices and market manipulators. Many have lost substantial portions of their retirement. Yet the banks continue to prosper. In spite of the uncertain environment, people are still encouraged to acquire and use credit cards. They are enticed by one percent cash back when the interest rates are many multiples of this amount. There is a serious design flaw in the system… or is it working as designed? Proverbs 22:7 tells us, “The rich rule over the poor, and the borrower is servant to the lender.” And we are still looking to restore the lending operations and the Fed is still keeping interest rates at levels that discourage saving and encourage debt accumulation… and the wealthy are still wealthy. Yet the the supposed goal of keeping a lid on inflation, does not quite seem to be in the offing as the Fed is continuing to “print” money and adding it both to the US and world economies. Even a rudimentary understanding of economics understands that more dollars with no increase in the supply of goods will, most certainly, push prices upward in a process we call “inflation”. It kind of makes one wonder… doesn’t it? This inflation, is seen by some as the only way out of the national debt our national government has been piling on itself and the taxpayers. It has the “virtue” of paying back our creditors with cheaper dollars. It is also seen as the only way to restore housing values decimated by the government induced mortgage crisis. While saving some homeowners, inflation acts as another hammer to beat down saving as down saving as the dollars withdrawn will have less purchasing power than those saved. So… what can happen with design flaws? How bad can they be? Particularly for the younger folks who have not seen this before, check out the what really happened to the Tacoma Narrows Bridge. Let’s hope our economy fares better.